I feel this especially on days like today: the fourth of July. I write this from my in-laws’ cabin in Wisconsin, where family has gathered over the weekend to enjoy the lake, share meals and play games. I see this with renewed enthusiasm through the eyes of my cousins who are seven and five. For them, the phrase “we’re at the cabin” is meant to invoke a feeling of Sabbath—here, we don’t have to take off our shoes as we run outside to inside, we can jump on the beds in the basement, and there is a spaciousness of imagination that I can only attempt to recover as an adult. I enjoy the time as well: two days ago, I saw a family of turkeys and four baby raccoons as I was walking down the winding lakeside roads. I’m also having cheeseballs for breakfast. How do I reconcile this seemingly joyous time with the bloody history of our country—the reason we all have the days off? There is so much privilege inherent to our time together. Additionally, I struggle with how to name systemic racism, the fact that our country was built on the cultural genocide (and plain genocide) of Native American and African people and how that (so starkly seen in recent events) continues to live out and how our time at the cabin is not separate, not a vacation from that reality. Like many of us, I find myself posting articles on social media that express what I am trying to in a more coherent way. (I also don’t let myself off the hook thinking that posting, liking and sharing is enough.) This morning, I was looking for something about the 4th, and discovered Mark Charles’s The Dilemma of the Fourth of July. Charles names the systemic racism in the founding documents and calls every American to read or re-read the Doctrine of Discovery. He further calls those of us in the Church to know the Church’s historical role as well. Charles says that we cannot hope to have cross-race community until we have weaved a national story that includes all memories, all sides. I invite you to read his article, and support Charles’s work here. In the spirit of knowing our own histories and working towards racial reparations, I would additionally point folks towards Confessing Our Vicious History: White Catholics and Violence Against Black Churches. In responding to Black Churches Burning in the country we celebrate this fourth of July, educating ourselves on the history of the Catholic Church in America is a great place to start. I’d like to thank Call to Action’s own Katie Grimes for this excellent resource. I will be posting additional information about actions we can all take together in response to violence against Black Churches. 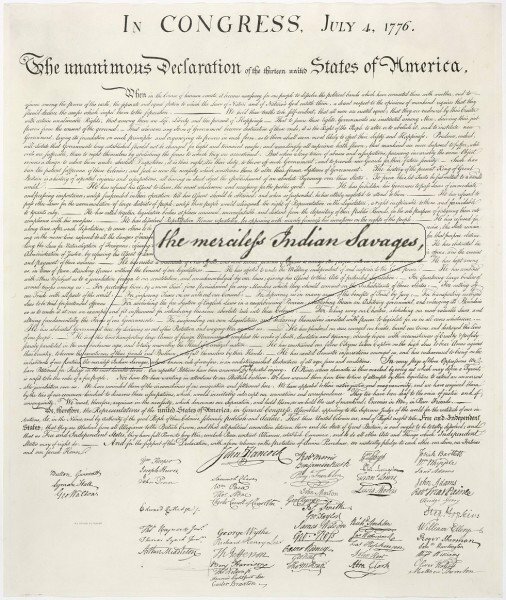 Wherever we find ourselves this Fourth of July, I hope we remember that our stories are not separate from one another’s, that we are finding ways within our individual and collective callings in our individual and collective contexts to heal the wounds of our nation’s history. Today, I will be present to my young cousins and build the foundations to teach them about what it means to not shut out and muffle white moral crisis but let it move us towards active presence in these struggles. With the elders and other adults in my life I will compassionately share how my heart is crying out for justice today. I will continue to pray for courage as I move my feet to where they need to be. And, I will continue to be grateful for all of you as we walk these roads together. Sarah Holst is the editor of Call to Action Young Adult Catholic Blog. This entry was posted in News & Media, Peace & Justice, Spirituality and tagged American Catholicism, Mark Charles, whiteness by saholst. Bookmark the permalink.